Redefines fun from the bottom up! Watch the dramatic cascade of wine on the decanter walls as you empty an entire bottle. Acidity and bitterness evaporate as your wine flows, allowing taste and aroma to fully develop. If you prefer the romance of serving wine (particularly a high-end wine) from its original bottle, you can return the wine from the decanter to your bottle using the Wine Breather adaptor (included). You can also serve straight from the decanter. The choice is yours. Cork presenter is included as free gift. Size: 8"H with adaptor, 48 oz. Once the decanted wine has been returned to the bottle, how long does the aerated wine remain decanted? In short, how soon should the wine be decanted again, if ever? I own one and have given three as gifts. I tell everyone that rinsing with hot water after use is OK. Concur? BEST ANSWER: I have not decanted any wines a second time. However, I typicaly decant and aerate within 30 minutes os use. We've had the bottles open for a few hours, and the wines have been fine. I generally don't keep open wines around. WIth regards to cleaning - yes, warm water is the only thing I use. I do remove the transfer stopper to allow the carafe to fully empty. Hi, as to the previous answer, i woudl agree that many wines will not need to be decanted a second time. Typically you should decant and aerate within 30 minutes prior to use. Cleaning with warm water is the only thing I recommend. You should remove the transfer stopper to allow the carafe to fully empty. I usually decant it twice, one immediately after another and that seems to work great. I don't decant it again after that. I also only use hot water to clean and don't have any issues with that. Do you offer a replacement cap to order? BEST ANSWER: The Menu Wine Breather Carafe comes as a complete set, we do not offer just the replacement cap. Thank you. Would you have the website of the manufacturer of the decanter? Maybe they would sell a replacement cap? Is this the Danish version? or the made in China version? BEST ANSWER: Thansk you for your question, the Menu Breather carafe is hand-made in Denmark. Yes, please follow "international checkout" process at checkout. Do you have a larger quantity discount? since it is a closed system, isn't the aeration minimal? BEST ANSWER: Thanks for your question. After you pour the wine into the Menu Breather, you can remove the top adapter to expose the decanter to air. The wine will be aerated. What happens to the sediment? BEST ANSWER: The Menu Breather is intended to aerate the wine straight into the decanter - there is no screen. If you have sediment you would then pour the decanted wine thru one of our funnel and screen sets. Need a part for wine breather, where would we find the parts list? We bought this for 3 friends over the holidays. When visiting one of the friends, my husband asked why we didn't have one. I told him we have a aerator that went on a bottle of wine. He said he liked the idea of the presentation and wanted his own. We purchased one for ourselves and he is happy using and displaying it. 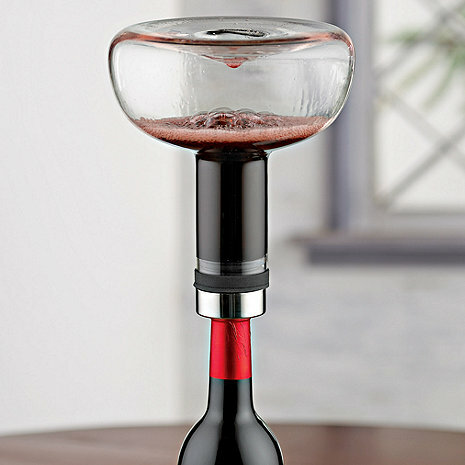 This is a really cool way to aerate wine during a dinner party. Everytime we used it we ended up opening up way more wine than planned, so our guest could watch the wine flow into the carafe and back into the bottle. Only downside is you need to make sure the wine bottle is stable on top of the carafe before you let go. We've never lost a bottle, but we have had some wobble. It also makes a great gift to give for house warmings or dinner partys. Great. Helps lower end wine. All three gifts arrived promptly, well packed and worked exactly as described. All recipents loved the ease of use. What a great wine toy this is. Takes care of the whole bottle, so no more a glass at a time. Always an attention getter at parties. i've given this to 3 couples now, and they've all loved it! it is surprisingly rare for wine lovers to own an aerator, i've learned. most people are surprised to see one that is so easy to use as well. i highly recommend it as a great gift! Our waiter at a restaurant used one of these, and we had to have one! It's incredibly neat to watch and works very well as a decanter. We have used this every night since we got it. We used to breathe some wines in a decanter but now that we have this we breathe everything. It is fast, fun to watch and it DOES make a difference. Two runs through the aerator is like an hour of breathing time. No more waiting onthe wine to open. Works perfectly as advertised. My guests had fun watching. Very practical. Easy to clean. We saw this being used by several wineries in Napa, and had to get it. It is very quick and can be poured back into the bottle for a second aeration if you want (that's what we do). You have to hand wash it, which is the only downer. Great product! We love the ease of serving wine straight from the bottle and this makes it easy! It has become a great conversational piece as our guest watch it in action. Everyone I know wants one now. Makes a great gift. Works perfect everytime, Easy to do whole bottle. Love this item. I think a strainer to catch sediment would be a welcome addition.Some of my older wines throw off quite a bit of sediment. I bought this item because it looked like it would be fun, (and it is) It also does everything that it is supposed to do. Quality and price are both excellent, and I recommend it. My son bought me one as a gift, since then I give them away as gifts, really like it! This Wine Breather Carafe does just what it is supposed to do, with little hassle. You can serve from the finely made carafe, or from the bottle--two really good options. Reasonable price, practical, excellent quality. Absolutely worth buying and using. Use it Frequently ESPECIALLY for Full bodied Red Wine varietals. Excellent choice for Home use or Gift for Wine Enthusiasts! Would love to send you Videos I've taken demonstrating It's astounding results. They are posted on Facebook. Nether the less, This Genius Wine Breather Carafe can decant one bottle of wine in less than 1 minute! Quite Amazing & fun to watch. This is my second carafe to replace my original purchase years ago when it first came out. This is the second wine breather we have purchased. This one is a gift. It is the perfect gift for anyone who enjoys wine. Every wine can be enhanced when it meets air. The wine breather does this beautifully. When I have a "difficult" wine that requires a long breathing period, I use the Wine Breather carafe to shorten the time. I could not be happier with a product. This is by far my favorite decanter of all time. Easy to use and classy look. I love it. Unbelievable how easy and how much difference this makes in aerating the wine. best invention since four hours of decanting! Yep, pour it out, pour it back in... and waaa laaa it tastes like it has been decanted for 4+ hours ~! Who ever plans their (4) bottles of wine (with friends) for the night 4 hours ahead of time!? no one! I recommend this product. Works great and really does only take the two minutes as in the description. Plus has a great "cool" factor. This makes a great gift and if you don't have one, you should consider one for yourself also. Saves time and fun to watch. I like my aerator/carafe and know that it works based on some comparison tasting. Should have purchased the cleaning brush and drying stand. Best ever. Better than the Vinturi twice the use. Please try you will love it. I bought this as a gift for my dad (the guy who has everything). He loved it and we could all taste a remarkable difference in the wine. Makes a difference to the wine and opened up the conversation around the table. Easy to use and clean, since it goes in the dishwasher. I gave this as a gift to two family members. Both had read about it in Wine enthusiast and were very excited to get it. They both liked that any unused wine could be returned to original bottle. You can use this simply as a decanter, or can single, double, tripple aerate, ... your wine. Perfect to aerate and re-bottle for blind tastings. This product is easy to use and really aerates the wine. I like that after the process, the wine ends up back in the bottle. Nothing much to say..this just works. We used to buy from a certain winery but prices were higher. No need to pay for logo. This is the same product. I love this carafe. The only problem I have encountered is the connection to the carafe is not as easy as it should be. If you are not careful, it will leak. Other than that it works great and itâ? ?s fun to use! very entertaining show for fellow wine lovers. Any decanter and funnel would do the same job but would never be as much fun!!! Great for wine lovers who have all the toys and always want a new one. cheers. neat decanter. No screen, so sediment cascades down into decanter with wine.